Thanks, Chris, for doing this blog. I was saddened to hear about Ruth's Chris Steakhouse, especially the one on Broad. When I graduated from Loyola in 1988, our family attorney who had been with us since I was 2 years old took my family to Ruth's Chris on Broad. It was my first visit to this New Orleans establishment. I can't believe it's gone. I now live in London and have been away from my home town for 18 years. I go back a few times a year to visit family. They are now displaced and not sure if they are going to return being from the hardest hit in St. Bernard. In the first few weeks after the devestation, when people asked me where I was from, I said "I'm from New Orleans...I'm from Nowhere." I had lost hope. Not only are the businesses not returning, but the people are not as well. I am so sad about this. I hope this will change. I hope that I will have a home to go home to. 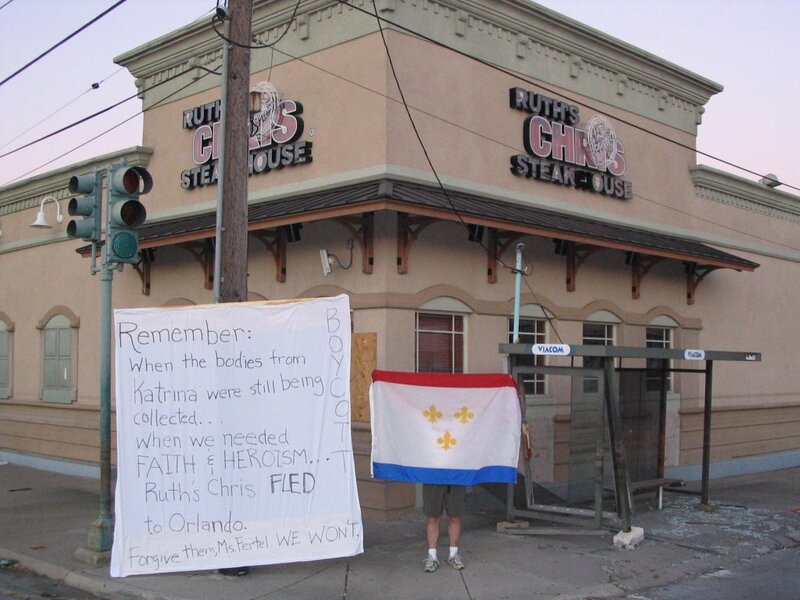 The Ruth's Chris move is especially disheartening when you consider the stories about how Ruth herself opened the joint and served free steaks to people during other hurricanes. Her reasoning: the power's out and this is all going to go bad, so we might as well eat it. Someone who does something like that would never move a company at a time like this. We just have to hope that Charlie's Steakhouse on Napoleon and Dryades opens up. Okay - so where'd you get the flag? That was the first thing I looked for when I came back to New Orleans - but no where to be found. My brother had purchased the flag from City Hall last year; they were selling them. Not sure if the flags are for sale again. I might suspect that the folks selling the flags were among the 3,000 people Nagin had to lay off. I'll try to give a call. If I hear back, I'll post here and on the blog.